Great on-the-go single use interdental brush. 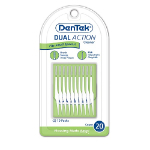 DenTek Slim Brushes are a disposable, on-the-go, interdental option for flossing and cleaning. Get all of the cleaning ability of traditional interdental brushes, but with a more sanitary single use option in a compact design. 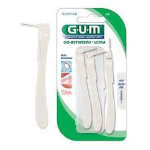 Floss and clean with the most sanitary and only disposable interdental brush on the market.